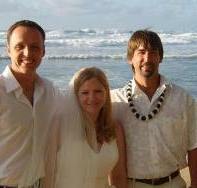 Maui’d Forever is a leader in providing wedding services and choices for your wedding vendors. Most important, the person officiating your ceremony! We have a variety of ministers to choose from. Your ceremony can be religious or not. We can usually accommodate your desires. Most all of our ceremonies begin with a lei exchange between bride and groom. Many of or ministers blow the conch shell to start the wedding and some use that as the signal for the bride to arrive while the groom patiently waits. Choose your minister from our list below. We offer a variety of officiates and can accommodate jewish, catholic, christian and other non-denominiational traditions. Not religious? We have that too. Call Mark at 808-268-8339 to request a copy of your favorite ministers vows. Rev. Harold Kilborn is our most Authentic Hawaiian Minister. 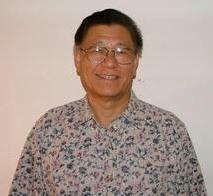 Born in Hawaii and raised on Kauai he is the pastor for the “Old Koloa Church”. 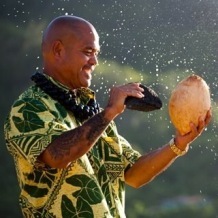 Many say he is the best conch shell blowers in the Hawaiian Islands. Harold is only available from Kapaa south. He does most of his weddings at the famed “Shipwreck” beach and also has his own secret spot. Rev. Niles Rev. Niles is a traditional Hawiian minister who will delight. He blows the conch shell and together with his wife will entertain with his Hawaiian guitar and singing. Niles and Aileen Kageyama together. Rev. 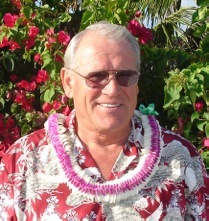 Pat, I have been a Wedding Officiate on the beautiful garden island of Kauai for seven years. I perform a Christian/Hawaiian ceremony. However, I customize each ceremony to fit a couples wishes. Rev. Wesley Cronk has been in the ministry for 40 years and really loves to meet new couples and marry them. None of our Kauai ministers gives more personal attention to the actual couple getting married than Wes. He offers one of the best Christian ceremonies and often counsils the couple before the wedding. Rev. Ed Terui delivers a wonderful Hawaiian wedding ceremony. Rev. Karen Backinoff Reverend Karen Joy is an ordained interfaith minister and has lived on the island of Kaua’i since 1994. She has 18 years experience officiating simple, intimate weddings as well as elaborate and elegant celebrations. Karen is a confident and caring person and her ceremonies are joyful, positive and heartwarming. 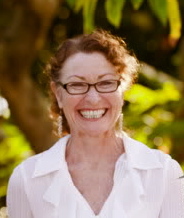 She brings her extensive knowledge of the island and Hawaiian Culture, which is reflected in her service. Ceremonies can be customized to suit the unique expression of each couple. You can choose from a Non Denominational, Contemporary Christian or Commitment Ceremony, which all include a Ring Blessing. Other religious observances are available upon request. 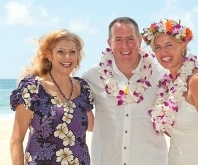 You can have Hawaiian options including a lei exchange and a Water Sharing Ritual or a Sand Ceremony. She has a lovely assortment of vows to select from and many readings on Love, including a Native American Wedding Prayer. Each wedding Karen Joy officiates includes a beautiful Keepsake Certificate to remember your special Hawaiian Wedding Day. Rev. Tommy Tokioka brings a positive energy, bright l spirit to your Hawaii wedding. Non-denominational, traditional, religious wedding ceremonies and vow renewals. Rev. Gordon Dodd Offers multi-cultural compassionate, intimate and fun weddings and ceremonies of all kinds; pre-wedding counseling by appt. Living in Kauai has made me more passionate about officiating God’s glorious connections in the beautiful and colorful natural locations all over the island. My commitment to you is to provide you with a ceremony that reflects your vision for a perfect wedding to create many blissful moments. I want your ceremony to have an outcome of an unforgettable day to remember always.